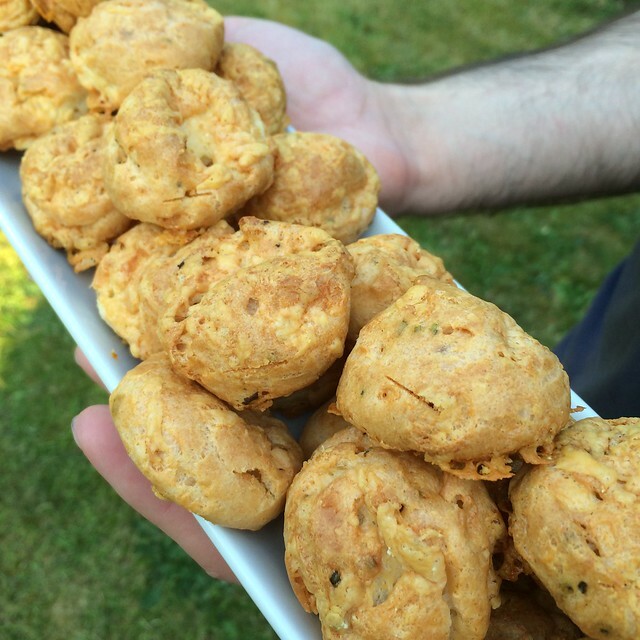 I’d heard of gougères before I made them, but I could never really understand why people raved about them so much. 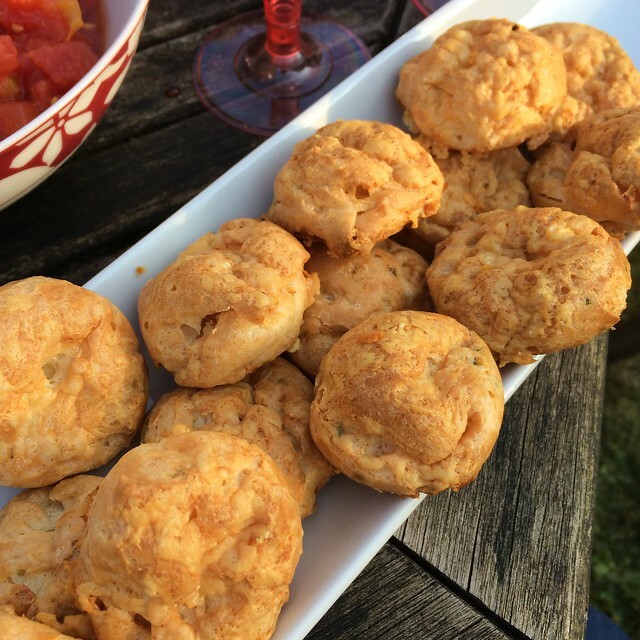 Basically, these are cheese puffs, made from the same kind of pastry usually used for patisserie like eclairs or choux buns – except this is a savoury version. 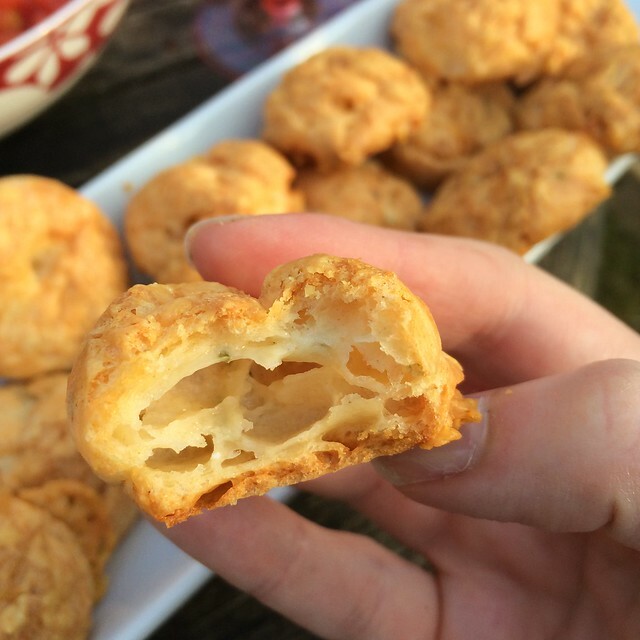 They’re just cheesy, pastry bites – but in this case, the whole is more than the sum of its parts. Trust me when I tell you that these will be devoured in short order at your next party – and they’re so chic you can even serve them for something formal as well as a BBQ! Prepare all your ingredients before you start cooking! Preheat oven to 220c, and line a baking tray with greaseproof paper. In a saucepan, add the water, butter, salt and cayenne pepper, and heat until the mixture is melted. Dicing your butter speeds this up! As soon as the butter has melted, add all the flour in and stir vigrously, until everything is incorporated, and the mix pulls away from the sides. Allow the mix to rest away from the heat for two minutes. Beat in the eggs when the mix has cooled, one at time, making sure to do so quickly so that you don’t scramble them. And don’t panic if it looks like it has gone lumpy, just keep on mixing! 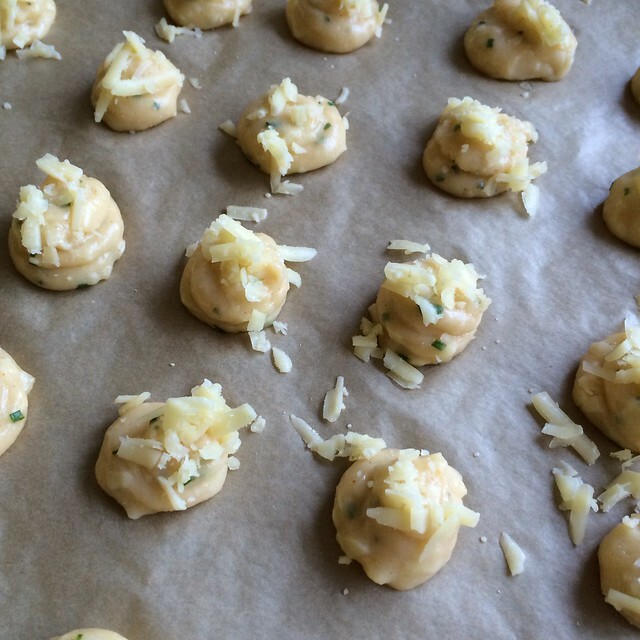 Add in three quarters of your cheese and the chives if you’re using them, and mix well. Put the mix into a pastry bag with a plain tip, and pipe into little balls about the size of your first thumb joint. Top with the rest of the cheese and place in the oven to bake. Bake for 10 minutes, then turn the oven down to 190c and bake for another 20 minutes. Then, for extra crispy gougères, make a small slit in the side and bake for another 5 minutes. You will also briefly wonder if the fact that these are 50% air means that they contain half the calories. Then, you’ll think about cheese and bikinis, and the sad incompatibility of the two. Then, you’ll eat another gougère and tell yourself that you’ll fast and do yoga to compensate. Then, you’ll realise the gougères are all gone, and you ate them, and you’ll reflect that bikinis are overrated and shark attacks are possible even in domestic swimming pools, so really, it’s better that you spend all summer indoors, eating gougères and wearing a kaftan. Recipe from David Lebovitz, original here.